It’s been 173 years since the Franklin Expedition departed England to locate a Northwest Passage, only to fail in the most disastrous, miserable way possible. The story of the expedition and what, precisely, happened to its 129 men has long been a subject of fascination for historians and explorers, but it has also generated a considerable number of artistic works — plays, poems, songs, books, films and paintings among them. The latest addition to the Franklin cultural canon is The Terror, AMC’s 10-episode series based on the 2007 novel by Dan Simmons. The show, starring Ciarán Hinds, Jared Harris and Tobias Menzies, premiered tonight, much to the delight of Russell Potter and Stephen Smith, both of whom are aficionados of all things Franklin and will be reviewing each episode of the show for Canadian Geographic. Their takes on this evening’s double-episode premiere appear below. This story can still evolve — we may find out more, or people may come up with other ideas or other interpretations. After we’ve had “Franklin the dope” for a little while, undoubtedly we’re going to get a different Franklin; people are going to say he wasn’t such a dope, really he was a mystic — or something. And of course it is. Even the viewers for whom this story is entirely new will know from the first scene, where an unnamed Franklin searcher questions a Netsilik Inuk about “Aglooka,” said in the oral testimony to be the last man standing. The Inuk identifies Crozier from his Daguerreotype (a lovely touch), then tells his listeners that this man was dying, warning away others, pursued by some shamanistic creature made of “muscles and spells.” He underlines his testimony by scattering a few naval buttons over Crozier’s likeness — these are all that is left of the man. Moving back to 1846, when those buttons were still on their uniforms, the rest of the first episode establishes the drama, and it’s as dark as their navy broadcloth in the dim-lit ship’s wardroom. The tensions between the men are sharply drawn, and portray a scene far harsher than the genial conviviality the actual officers described in their last letters home the year before. Of course, the Arctic may do that to a man, and already the omens are ill; besides the three men buried at Beechey Island in the first winter, others are sickening, vomiting blood, wasting away. And that’s only the natural peril, not to mention the supernatural one that, hinted at here, lurks in the shadows of episodes to come. In the second episode of the opening double-header, the frozen hands of time are advanced to the following summer (1847), where we see the ships, still frozen in, sending out land parties in search of open water. I was surprised to see that these parties were depicted hauling boats on sledges — an act that’s usually assumed to have occurred only after the ships were initially abandoned. Still, it makes for gritty realism; the shots of the men’s legs and feet as they haul away, and Goodsir’s stumble on his first attempt at pulling, give a vivid sense of the effort required. These searches bring us to the first encounter with things more than natural: football-sized hailstones, and a strange beast that overturns both boat and sledge, and claims the first of what we imagine will be many lives. 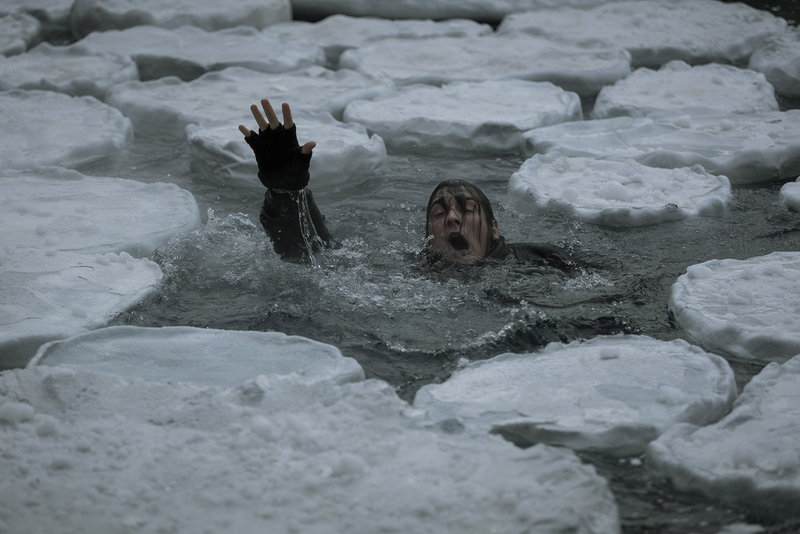 Efforts to repel the beast with rifles lead to the accidental shooting of an Inuk elder near the scene, who is then brought aboard the Erebus with his daughter, while Goodsir attempts to save his life (the arrogant Stanley, the ship’s senior surgeon, refuses to treat him). Crozier attempts to comfort the daughter and assure her that she is among friends — we see him speaking passable Inuktitut and identifying himself as “Aglooka” — and all that is consistent with the facts, as he was said to have acquired a passable command of the language during his time with Captain William Parry at Igloolik in 1822. And it’s from the daughter that we learn of her fear that, should her father die, she would be unable to control the supernatural forces that he — apparently an angeko or shaman — had set loose. The sense of foreboding is palpable, and the tension rises as it becomes clear that, despite Goodsir’s best efforts, the father is beyond saving. All this takes place within the many little vignettes of shipboard life that the writers have used — sparingly and well — to set the larger stage: we see both Franklin and Crozier puffing at their pipes (neither actually smoked) and musing; a furtive sexual encounter between two crewmen below decks, and even good old Neptune, the ship’s dog, relieving himself in Crozier’s cabin. For the secret of horror, as Edgar Allan Poe divined many years ago, is to keep the edge of verisimilitude as sharp as it can be, right up to the very moment that the improbable or impossible elements burst onto the scene, our defenses lowered by our embrace of the reality before the unreal. As with Dan Simmons’ original novel, well-researched history is only the platform here for something much worse — and given that the actual Franklin expedition ended in death, despair, and cannibalism, “worse” is saying something. The mood is delightful in its darkness, and the ships — recreated with crystalline accuracy from their original plans — trace a track through the ice that, with every creak and crack, brings us closer to a looming something, a doom that beckons us relentlessly, even as it repels. I’d also ask if you have a favorite among the supporting cast — of course we are all meant to love Goodsir, but I also am growing fond of the sly, sometimes-duplicitous Cornelius Hickey (Adam Nagaitis). He really brings a lot of life to the fellow, who I may note is also the only man I know to have carved his initials on a full set of cutlery: fork, spoon, and knife, and skillfully so. I spent some time on King William Island in 2007, chasing Sir John Franklin’s tale, and I’ve pursued him doggedly since then, as an attentive reader of all texts Terror and Erebus. Whether trekking the shale barrens in Nunavut or navigating books of exacting scholarship like yours, Russell, I’ve kept up (I confess) a minor but consistent curiosity about just where I might have fitted into the discovery service amid the icy labyrinth of the Canadian Arctic. Could I have hacked it up there in 1846? And if so, more to the point, what’s a job I could have done? Patrolled amidships as a stout marine, maybe? Served, perhaps, as a purser’s steward, lending a hand with the pursering? Mate has a ring to it, and I like the sound of ice master, though I’m not entirely sure I’m all that qualified for mating or mastering. All this by way of tacking around to answer your questions, Russell. Given the horrors to come, the lighter moments all have a grim, gallowsy feel to them. But I did like the belowdecks discussion of just what naval rank Terror’s ship’s dog might hold, and the men’s not entirely hilarious conclusion that Neptune almost certainly outranks all of them. I am drawn to the dog, I have to say, but I think the answer to your second question about supporting characters is the same one I’d give myself regarding where I might fit in, shipboard. In both cases, Harry Goodsir’s my man. The more I see of the assistant surgeon on Erebus, the more I think I could work with him. I don’t know how much help I’d be, but I do like the calm and the cheer Paul Ready gives him, his can-do, helpful way. He seems to be resolved to do the right thing, with just the right amount of quaking apprehension. I would have to excuse myself from that autopsy he performs on poor David Young — I’m much too queasy-stomached for that. Of course, there were good reasons to steer clear of even imaginatively enlisting in Franklin’s expedition, long before Dan Simmons put his fictional twist on the history. The Terror wastes not a moment in sailing us deep into Arctic danger, and getting us good and petrifyingly situated there at the edge of the map, where scurvy and consumption stalk, frostbite and botulism, not to mention starvation, much less the specific risk of falling off the topmast, or more general ones, like freezing to death far so from home. There is a pitying part of me that wonders whether Franklin’s unfortunates really deserve the added lurid horror of whatever it is that’s stalking the ships — “a thing made of muscles and spells,” is as much as we know so far, from the appalling description offered by the Netsilik Inuk character in the series’ opening scene, not too long before Lieutenant Graham Gore goes missing, i.e. devoured. He does know what he thinks to be his duty, and part of that is to maintain morale, whatever the cost. “Your demeanor should be all cheer, gentlemen,” he commands at one point. I guess that’s one way to cope with all the impending gloom. Back in real-life London in 1847, at least one old Arctic Admiralty hand was maintaining the same sunny outlook. “I do not think there is the smallest reason of apprehension or anxiety for the safety and success of the expedition,” Sir James Ross wrote, right around the time that Franklin and his officers were understanding that their ships were stuck in the ice, fast and fatal. If you’re going for blithe optimism, that seems as good a dose as any. It’s the one I’m sticking with this week, anyway, waiting on what’s next for our doomed Argonauts. What else, after all, could possibly go wrong? 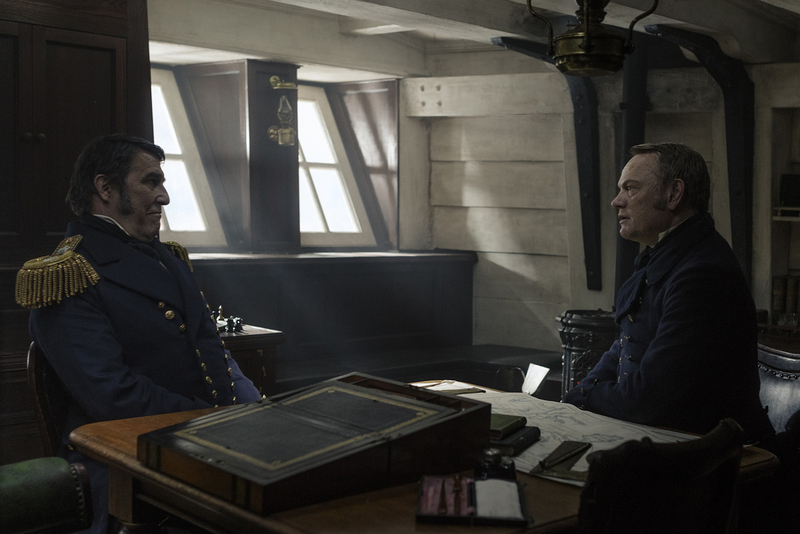 Russell and Stephen's recap of Episode 3 of The Terror will be published April 3. While you're waiting for it, read an interview with executive producer David Kajganich.